Texas Stars president Rick McLaughlin was on The Sports Buffet this afternoon on AM 1300 The Zone. He shared a very special announcement with the radio audience. The Calder Cup will be making a visit to the Cedar Park Center during the Game 1 Watch Party on June 3rd. Additionally, he predicts the Stars win it all in Game 7 overtime because "we wouldn't do it any other way". Apologies for not getting this up yesterday; I was otherwise occupied between 4 PM and the game. Yesterday, Scott White appeared on "The Bottom Line" for the weekly On The Ice report. Lots of good talk about Game 7. Feel confident in your smugness listening to it and already knowing the outcome. Here are the postgame interviews from the Stars locker room. In case you hadn't already seen it posted elsewhere, here's the schedule. Note that there is at least one day of rest between each game and that the series doesn't start for another week. Here's hoping the CPC is available for all away games; I heard it was a rockin' good time. Nothing would keep these Texas Stars down tonight. Despite being outshot 34-11 in the first 40 minutes, Texas turned it on in the third period to score three goals and take the game 4-2 and advance to the Calder Cup Finals. Texas got massively outshot in the first period 15-5. For the most part, Hamilton didn't get as many quality scoring chances as the total would suggest, but Coach Gulutzan's law of averages came into play. With nine seconds left in the first, David Desharnais buried a rebound from the left side on a rebound of Aaron Palushaj's shot. The shots counter was anymore friendly to the Stars in the second. Texas's Matt Climie saw 13 shots on goal before his teammates had mounted a single shot on Curtis Sanford. At 5:32 of the second, Max Pacioretty grabbed his own 2nd rebound off Climie's left pad and pushed it past him for a 2-0 lead. Texas got one of its own to get the goose egg off the board. On a rather routine and simple play, Ethan Graham tossed on a shot on Sanford from the left point. Really it was just a dump-in more than anything else, but the bouncing rolling puck flipped up on Sanford and beat him on the far side. It was Texas's 10th shot of the game. The Stars would finish the period at a 34-11 SOG deficit. The Texas Stars would not be kept down though. Texas had an epic third period for the ages. Mathieu Beaudoin scored his third of the playoffs stickside high on Sanford to make it 2-2. The craziness had only begun as Texas wouldn't let up. Perttu Lindgren put another one past Sanford to make it 3-2 with 6 minutes left. Hamilton tried to bring the pressure but to no avail. And just as Sanford was about to be pulled for the extra attacker, Colton Sceviour and Jamie Benn broke in 2-on-1. Benn beat Sanford on the pass from Sceviour to seal up the game tight. Texas talked a good game about character for this entire series and really left it all out on the ice in games 6 and 7 of the series. Texas, at one time in the game down 2-0, scored four unanswered goals to win the game. Matt Climie stopped 41 of 43 shots on goal and has now stopped 92 the last 96 he's faced. Postgame quotes and pictures are sure to follow. Texas will start their series against Hershey on June 3rd in Pennsylvania. And so again, the Texas Stars will put their playoff life on the line in a Game 7. Texas's second Game 7 in as many series will be for a spot in the Calder Cup final against the East Conference Champion, Hershey Bears. With the defeat of the Montreal Canadiens in this year's Eastern Conference Finals in the NHL, Hamilton will get some top-flight players back in the lineup. P.K. 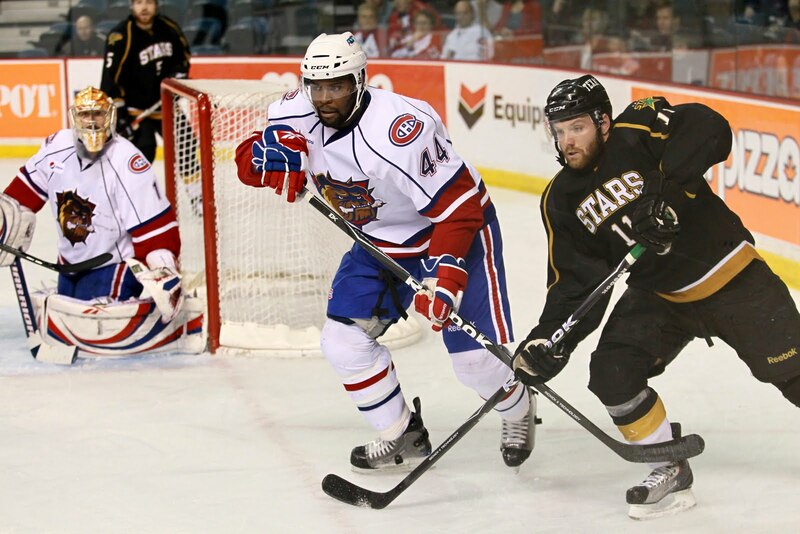 Subban and Ben Maxwell will be in the lineup for the Dogs tonight. Subban was an All-Star this year and got an extended call-up to the eighth-seeded Canadiens for their unlikely playoff run to the ECF. "[Subban and Maxwell] are great players, and I'm sure they're going to help their team," added center Aaron Gagnon. "But our game doesn't change going in." Some have noted that Subban's likelihood to step up on the rush might leave some offensive opportunities for the Stars on odd-man rushes. It seems Subban did this in the final Canadiens game, and it led to a Flyers goal. Coach Gulutzan firmly stated, "[Game 6] was our best start of the series." Texas took early shots and came out on fire, but Hamilton scored first. Gulutzan noted that Texas hasn't scored the first goal in a game since Game 4 of the Chicago series. That sounds hard to believe, but it's true. Travis Morin's goal in the May 5th game in Cedar Park was the last time that Texas drew first blood. And yet in the games since, Texas is 5-4. "I think we have to come in Wednesday night and look for that first one and don't look back," said Gagnon. With 51 saves on 53 shots in Game 6, Matt Climie is hitting on all cylinders at just the right time. "Sometimes it takes a guy some time to get going," concluded Coach Gulutzan. This is Matt's series, and he has very much proven his worth here in the net for the Stars. Hopefully the Stars can minimize the shots on Climie so that tonight isn't a 50+ shot night. As Coach Gulutzan quipped, getting shots on goal is about the "law of averages". That works both ways. Coach added that he had one adjustment he wanted to make but otherwise would keep an even keel going into Game 7. I am assuming that it has something to do with the usage of Chupp in the lineup or perhaps Wilson will be healthy. At this point, Gulutzan admits, "I don't have any tricks up my sleeve". "It's gonna be a battle of wills. Game 7 usually is." The Montreal Canadiens announced today that forward Ben Maxwell and defenceman P.K. Subban have been assigned to the Bulldogs from the Canadiens. Both players are scheduled to join the ‘Dogs for their Western Conference Finals Game 7 match-up with the Texas Stars tomorrow night at Copps Coliseum. Maxwell, 22, played in one post-season game with the Canadiens in the 2010 Stanley Cup Playoffs but was held pointless. The 6-foot-1, 195-pound forward played in 13 regular season games with Montreal but was also held pointless. The native of North Vancouver, British Columbia ranked fourth on the Bulldogs in points with 44 (16 goals, 28 assists) after playing in 57 regular season games with Hamilton. Maxwell was drafted in the 2nd round, 49th overall by the Canadiens in the 2006 NHL Entry Draft. Subban, 21, played in the Bulldogs’ first six post-season games in the 2010 Calder Cup Playoffs, scoring two game-winning goals and earning nine points (three goals, six assists) before being recalled to Montreal on April 26th. In 14 Stanley Cup playoff games with the Canadiens, the 6-foot, 202-pound defenceman recorded eight points (one goal, seven assists) and helped Montreal advance to the Eastern Conference Finals. During the regular season, Subban ranked third on Hamilton and third amongst AHL defenceman in scoring with 53 points (18 goals, 35 assists) in 77 games. The native of Toronto, Ontario ranked second in the AHL in plus/minus with a rating of +46 and also broke five franchise records for the Bulldogs including most goals and points by a ‘Dogs defenceman in a single season. When the game goes to overtime, it always seems like the game is decided early or late in the overtime period. The Texas Stars and Aaron Gagnon decided it late tonight in the first overtime to force the second Game 7 in the Stars short history on Wednesday night. Texas came out of the gate with a quick pace. The Stars led in shots at one point 6-3, but then an Aaron Gagnon delay of game penalty turned the shots count the other way. The Bulldogs would strike first in the game with 3 minutes left. Rookie Gabriel Dumont scored on a rebound up over Matt Climie to bring the period to a close at 1-0. The period would end with a 14-10 shots advantage for the Bulldogs. Texas got a goal of their own on a delay of game power play. Garrett Stafford tallied his third of the playoffs on a rebound in front that he elevated above Sanford. Texas led the period in shot count 14-11 but allowed another goal at the end of the period. Shawn Belle took advantage of a Texas penalty to score on a centering pass from Brock Trotter. Belle was unguarded in the low slot and Texasfell to a 2-1 deficit. Texas and Hamilton battled it out in the third period, totaling 21 shots between the two teams. Hamilton got the better of Texas in that department, outshooting the Stars 15-6. Texas got the goal they needed though to take it to overtime. On a delayed penalty, Greg Rallo and Scott McCulloch broke in to the Hamilton zone. Rallo flew down the right side and managed a pass to McCulloch on the left side who bounced it past Sanford for the tying goal. Texas may have been outshot in the period, but maintained good pressure throughout the period. Matt Climie had timely saves as well to keep them in it. For the fourth time in the series, Texas and Hamilton would need extra time to decide the game. Texas and Hamilton played a cardiac game, with shots and chances going back and forth. Matt Climie was on top of his game stopping all 13 shots in the overtime period and 51 of 53 in the game. It came down to the stick of one Aaron Gagnon. Gagnon came down low to take a Jamie Benn rebound and sneak it in on the left side post of Sanford. Texas will now faceoff with Hamilton on Wednesday night at 6:30 to decide who gets the right to play in the Calder Cup playoffs. TH -- Do you have any idea what you want to do next after your playing days? I know you have one more year on your contract with the Stars. LW -- I want to get into coaching, but I still have that desire and passion to be a player. So I'm going to try to play as long as I can. Hopefully, with some of the connections I've made throughout the years, some doors will open up for me. But I'm still learning every day as a player. When you stop learning, that's when you should stop playing. You can read the full story here on the Telegraph Herald's website. Following two 60-plus minute games at home, the Texas Stars would only need 60 to decide the game tonight. They probably wouldn't have minded if the game was called after 40. An anemic offensive effort for the Stars and solid goaltending from Curtis Sanford put one more nail in Texas's playoff coffin. "We were a little flat," said Coach Gulutzan, "[Hamilton] definitely deserved to win." The Bulldogs took an early advantage with Ryan Russell potting a power play tally. Jamie Benn took the penalty, a questionable call for holding where Benn fell down and the guy he was standing next to came with him. Russell scored off the rebound to make it 1-0 13 minutes in. Climie talked about the goal, "My stick got tangled up with [Jancevski] in front and I couldn't really recover from it." The goal would prove to be the game winner. Hamilton piled it on in the second period, scoring two more goals for insurance. Mike Glumac collected a rebound in the low slot and fired it past Climie just past the 3 minute mark. David Desharnais added his 9th of the postseason with 5 minutes left in the period, roofing a shot over Matt Climie after skating in practically unabated. Texas had their chances, but nothing came of them. Benn mused, "We just gotta keep it simple and put pucks on net. We might be doing a little too much out there and I think we just gotta start shooting." Texas had a certain lack of execution in the game tonight. The passing game reverted to mid-season form with basic forehand to forehand passes missing the mark or bouncing off the stick. "We needed to win puck battles and we didn't have that tonight," added Coach Gulutzan. And indeed, it did seem that Hamilton was the team leaving the scrum more often with the puck than Texas. When you add to this equation a 33-23 shots advantage for Hamilton and eight power play chances in the game, it becomes difficult to formulate a winning game plan. Texas now faces elimination in Game 6 and will have to win both of their contest in Hamilton for the right to play Hershey for the Calder Cup. The Texas Stars and Hamilton Bulldogs now face a best of three, essentially, to make it to the Calder Cup Finals. With the series even at two, Hamilton has home ice advantage with Game 6 and a possible Game 7 in Ontario. Coach Gulutzan voiced the urgency of tonight's game, "The next game gets very important, especially when you're the home team with one home game left." The winner of tonight's match returns to Hamilton only needing to win one game to move on to the Calder Cup Finals. The Stars had 7 power play opportunities in Game 4 and could not score on a single one. In a goalie duel, where offense is at a premium, Texas has to take advantage of the man advantage. Four of those opportunities were in the first period, which would have provided a good early boost to the team's game. "Our power play was very lackluster," agreed Coach Gulutzan, "but Jamie Benn helped us out in overtime." And how about Jamie Benn? The rookie now leads all players in the postseason in goals (13 G) and is #2 on the points list (21 PTS) behind Chris Bourque of the Hershey Bears (22 PTS). The phenom was responsible for all of Texas's offense last night, despite my proclamation that someone other than Jamie Benn needed to score. The reason why it worked last night was the play of Matt Climie. Climie, who had been dinged for 17 goals against in 6 previous games, allowed just one goal on 27 shots. He improved his GAA to 2.89 from 3.32 and SV% to .906 in just one game. If Climie can show patience with the puck tonight again and keep the plays simple, then he can have success. The above does assume that Brent Krahn is not ready for action tonight, which remains to be seen. Krahn has been sidelined since May 9th's Game 6 against the Wolves when he suffered a concussion. A concussion is not one of those injuries you rush back from. It is more important to play it safe with Krahn's health. The Stars have found solid netminding in Climie if he can continue his play from last night. Matt Climie and Curtis Sanford battled it out tonight at the CPC in a 2-1 goalie duel that needed more than 60 minutes to decide. It was Jamie Benn in the overtime period who took the series to two all and guaranteed a sixth game Monday night in Hamilton. Texas and Hamilton skated to a scoreless tie in the first period depite four Texas power play opportunities. The Bulldogs got physical with the Stars early and often. Overall, the power play was 0/7 on the night. "[The power play] was kinda struggling tonight but we found a way to win," said Jamie Benn after the game. Texas allowed the first goal of the game on the power play in the 2nd period. David Desharnais scored his 8th of the postseason on a slow dribbler between Climie's legs. Of the goal, Climie shared, "I didn't let it get to me too much and moved forward from there and continued to keep the team in it". Texas would take a 1-0 deficit to the locker room. They had been outshout 11-6 in the period and 19-15 overall in the game. The Stars game back strong in the 3rd, starting the Benn-Gagnon-Sceviour line and getting amply rewarded for it. Only 24 seconds into the period, Colton Sceviour found Benn on the backdoor where he had an easy chip in for his 12th of the playoffs. The crowd was re-energized and so was the team. Texas outshot the Bulldogs 13-7 in the 3rd period. "Our character showed in that third period," said Coach Gulutzan. Texas had a bit of a scare in the game when a Bulldog coming out of the box snuck in behind the D pair and had a breakaway to the net. Dan Jancevski caught up with him and swung the lumber to knock the puck away. "Good thing Janny's six-four with a long stick," mused Gulutzan after the game. The Stars would take it to overtime for the second game in a row. And who else would you expect it to be, but Jamie Benn? Benn got in close on a rebound of Mathieu Beaudoin's shot and potted his 13th goal. Among the positives in the game, the biggest was Matt Climie. The Cedar Park Center got to watch Climie mature over these 60+ minutes. Climie focused more this game on economy of movement and being smart with the puck: "It's important that I take a step back and be more patient and let the puck come to me instead of being aggressive and getting myself out of position." Climie had some degree of trouble through the year with being out of position on shots and I think we may have witnessed a change in his style for the better this evening. Ethan Graham had yet to score a Calder Cup playoff goal in his entire career. In fact, Graham had only suited up for four playoffs games for the Stars before tonight. "It's probably my biggest [career goal]. I think I had an overtime winner in bantam, so... bigger than that!" said the unlikely hero Graham. Hamilton got a lot of bad angle shots in past Texas tonight. Texas countered with a lot of gritty goals from within 4 feet of the net. Hamilton scored first in this one, putting one in from a sharp angle with Matt Climie out too far to stop it. Texas answered with a baseball swing shot from Perttu Lindgren that beat Sanford glove-side high on the power play. Texas went to the first intermission tied at 1 with the shots advantage at 12-10. The second was fast and furious with 3 goals in the frame. Texas's Jamie Benn scored on the power play on a cram play in tight with Brock Trotter in the box for hooking. Again on the power play five minutes later, Texas's Aaron Gagnon collected a rebound off traffic in front of the net and shot it top corner to beat Sanford on the power play. Texas did a good job all night of getting in Sanford's face at the right time to create screens. Sanford didn't even see the Gagnon goal coming. Hamilton took it to 3-2 just a minute later as the puck popped out to the slot from Ryan Russell at the boards and Mike Glumac nailed it home stickside high on Climie. Aided by three power plays in the period, Texas led the shots count 14-6 in the frame and 26-16 overall. Hamilton's Brock Trotter opened the 3rd period scoring to tie it at three. Another bad angle shot from the goal line wide beat Climie on the power play. With 5 minutes left in the game and fans preparing for OT, Warren Peters again came up with a goal on another in tight in the crease goal. With 2 minutes remaining in the period, Aaron Gagnon took a questionable tripping call from referee Kyle Rehman and Texas was down a man. Ryan Russell tied it up on yet another bad angle shot down low. The Stars would need to go beyond 60 minutes to decide Game 3. And so we return to the unlikely hero, Ethan Graham. Just 2 minutes into the overtime period, Andrew Hutchinson, who already had two assists in the game, fed a pass along the blue line to Ethan Graham who drilled it for the final goal. Texas has a few things to tighten up before Friday night. The power play was great for Texas, going 3/4 on the night. Texas gave up two power play goals on five opportunities though. Additionally, Texas had to battle back after giving up the first goal of the game within the first five minutes. "It was a gutsy win," said Jamie Benn, who had two points in the game, "the gritty goals are the ones we need." Warren Peters on playing at home: "It's great here. If you look across the board, as far as attendance goes, we're right up there in the playoffs. That's a credit to the Cedar Park area and Austin and the people that support us. There's a lot going on this time of year, especially outside with the weather. We love the support. Coming home, it's loud all the time and it seems like they cheer no matter what. It really helps, especially when you're gassed and trying to fire yourself up." The Texas Stars return home to the friendly confines of the Cedar Park Center after a 10 day roadtrip. The team did not have time to travel back to Austin between Game 7 of the Chicago series and Friday's game 1. Tonight's game finds the Stars in a two game hole, something that they have not yet experienced in this playoff season. Coach Gulutzan sees a lot of similarities between this game and Game 4 of the Chicago series when the Stars faced a 2-1 deficit and had played poorly the night before, losing 5-3. "It's another Game 7," added forward Jamie Benn, "It's almost do or die". Like the Stars last game 7, there has been a lot of talk about character coming into tonight's game. The Stars need to do just a few key things better in order to win these games at home. Coach Gulutzan acknowledges the need to be better on the power play, which has been 2/8 in the series but went 0/4 on Sunday. Despite the overwhelming feeling, Hamilton is only one goal better on the PP with a 3/8 mark. However, one goal difference in a matchup between the #1 and #2 teams in regular season goals against is huge. The Stars coach feels that 85% of the PK is great, but "we have a 15 second gaffe that costs us a goal." Exactly, Coach. Texas knows what to do most of the time on the PK, but Hamilton is dangerous like Chicago was and will jump on any weakness in the system. A lock down night from the PK will be necessary to keep the series going. Texas had difficulty during the year with giving up goals early in games that put nails in the coffin prematurely. In two games against Hamilton, Texas has allowed a goal just past the 5 minute mark of the first and one just 28 seconds into the second to open the two game. "We need to start better in all periods and start the game better," Gulutzan added. Between the pipes, expect Matt Climie. Brent Krahn is still on the mend and will not be available until at least Game 4. While Climie's performance thus far (3.18 GAA and .900 SV%) has not been out of this world, the Stars have not been giving him the help he needs on the scoresheet to balance out the goals that get past. Climie commented, "I feel like I'm giving the team a chance to win every night." Climie clocks in at #16 on the overall playoff goalie performance chart on TheAHL.com. All of the starting goaltenders of the remaining playoff teams rank in the top 5, with the lone exception being Alex Stalock of the recently eliminated Worcester Sharks. Goaltending is huge this time of year, but I didn't have to tell you that. Also, the Stars should get a boost from the home crowd. Coach Gulutzan doesn't see much boost coming from getting last change here at home, but the crowd and familiar setting should help. The Stars suffered from poor defensive play in their own zone and fell for the second game in their series. Texas now heads back home in a 0-2 hole against the Bulldogs. Texas and Hamilton skated to a scoreless tie in the first period. In all realistic estimation, Texas did well to only skate to a 0-0 tie in the first. The Stars were outshot 14-6 and took two hooking calls in the period. What Texas lacked in quantity of shots, they made up for in quality of shots. Hamilton opened the scoring in the game just 28 seconds into the first period. 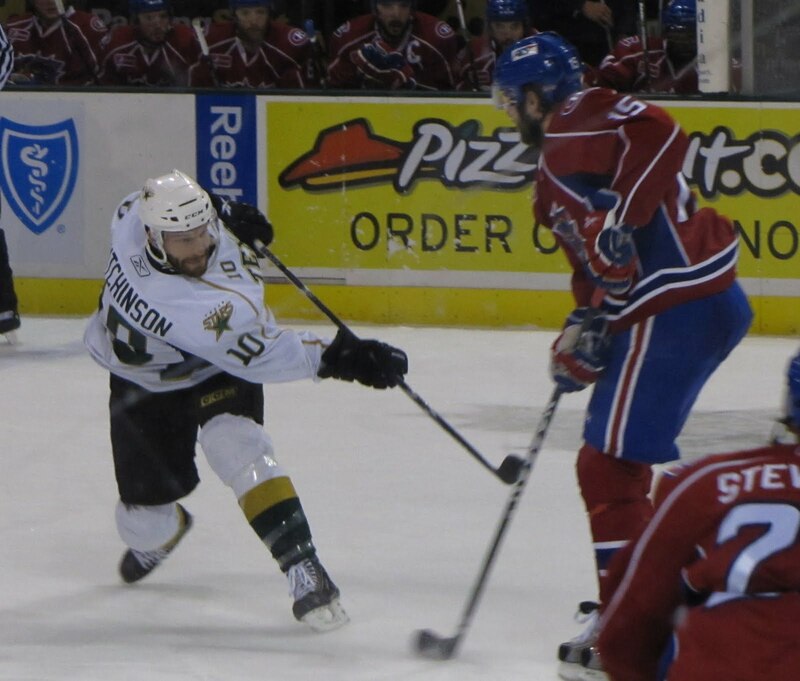 Again, the power play made the difference for Hamilton with Landon Wilson in the box for hooking. Hamilton scored again at even-strength just before the five minute mark of the period. Brock Trotter walked into the Stars zone unmolested down the right wing side. Climie stopped the initial bid in tight but the rebound bounced out to a trailing Alex Henry, who potted a practically empty net goal. Texas needed to close on the Bulldogs in the zone, but did not stop the trailer. Despite having 3 power plays in the period, Texas did not score with the man advantage. It took an odd angle bounce from the stick of Warren Peters to break the shutout for Curtis Sanford. Peters collected a hard kick off the endwall from Andrew Hutchinson and bounced it off either Curtis Sanford's back or a defender to make it 2-1. Texas would end the period with that score and be forced to mount a comeback and hand the Bulldogs their first loss after scoring the first goal in these playoffs. Texas outshot the Bulldogs 11-8, aided heavily by three power plays in the period. Just over halfway through the third, Hamilton added some insurance on a 2-on-1 against Fortunus. Greg Stevenson steamrolled Andrew Hutchinson, who was trying to keep the puck in at the blue line, in the neutral zone. Texas's forwards did not pull back and left Maxime Fortunus to face a two-on-one from Stevenson and Glumac. Stevenson passed to the left wing circle where Glumac one-timed the puck past Climie for a 3-1 lead. The game ended with that score; Texas got outshot 30-23 in the game. The Stars got burned for two of their goals on poor defensive coverage. For the second Hamilton goal, Texas allowed Brock Trotter to practically walk into the zone and then let Alex Henry drop in to trail the play unmolested. On the third goal, with Texas trying to pinch their defensemen in the third period, the Bulldogs broke in on a 2-on-1. This is not Texas Stars hockey. The Stars will look to improve with some home-cookin' on Wednesday. Remember that the Stars have not played a home game in over two weeks. In all honesty, we could just as easily be looking at a Texas 1-0 lead right now if it weren't for a few really 'dumb' penalties taken in the Stars first game in Hamilton. Texas took six penalties against a team that is now clicking in at 24.4% on the power play. It simply can't be done if Texas expects to win hockey games. Even if the Stars lock down the penalty kill, however, there is still the matter of shots on goal. Every minute you spend on the penalty kill is time that you can't spend raining shots on the opposing net. Texas was doubled up in shots in the girst game, 20-38. Suffice it to say that special teams are going to be a very important factor in this series because both teams are so solid at even strength. Again in net for the Stars, we will see Matt Climie. Climie had a pretty solid outing but didn't get any help from the conga line to the sin bin on Friday night. Allowing two goals through regulation is a pretty good night any time of year and should be enough to get the win if the offense does its part. The bottom line being that you can't pin the 1-0 series deficit on the goalie. He clearly was upset about the game, breaking his stick in half on the ice after the loss on Friday, and will definitely come out motivated for Sunday's game 2. Though only one game has been played, both teams have had limited 'team' success in scoring. David Desharnais and Brock Trotter, who will both garner more attention on Sunday, were the only two Hamilton goal scorers. Jamie Benn was the only one to find twine for the Stars. Texas will need team scoring through at least three of their lines in order to provide a balanced offensive attack that can supplement their defensive game. They didn't have that on Friday, with both goals being scored with the extra man on the ice. The Stars seemed to do everything right but took too many penalties in the game, giving up two power play goals, one of which was the game winner. Texas started the game with two quick penalties and yielded a goal on the second. David Desharnais scored down low on Matt Climie to make it 1-0 just 5:22 into the game. The Stars got a power play of their own just past the halfway mark of the period. Jamie Benn capitalized, whipping a weak shot five-hole on tender Curtis Sanford. Benn's goal was just the 3rd shot on goal in the period for the Stars. Desharnais made sure that the tie did not last long, scoring on a knucklepuck from the high slot. The puck ticked off Brock Trotter and beat Climie high. Texas was outshot 15-5 in the period. Shots were more even in the second period, where Texas outshot the Bulldogs 8-7. The Stars scored the only goal of the period on the power play toward the end of the 2nd. Again, it was Jamie Benn. With Mike Glumac in the box for tripping, Dan Jancevski fired a pass down from the left point to the bottom of the right wing circle where Jamie Benn one-timed it past Curtis Sanford. Texas went to the 2nd intermission tied at two. Texas and Hamilton skated a scoreless third despite three Texas penalty kills, including one that would extend into the overtime period. The final penalty was a pure mental mistake, a too many men penalty. The Stars last penalty of the period would prove lethal though, as the Bulldogs scored 14 seconds into the overtime period. Brock Trotter collected a rebound off Matt Climie and put one home tight on the left side. David Desharnais assisted the goal and had a three point night. Texas did everything right in this game and could have just as easily won. Texas gave up 6 minor penalties in the game though. Hamilton went 2/6 on the PP. Texas went 2/4 on the PP themselves though. It was a solid game by Texas, but the penalties killed the game. Texas will have to be more disciplined on Sunday to have a chance at the tie. In case you hadn't seen it twenty other places, here's the schedule for the West Conference Finals versus Hamilton. The Texas Stars, in their first Game 7 ever, couldn't be kept out of it. After being down, 2-0 and 4-2 in the game, Texas came back to win it 6-5 in overtime. Matt Climie shook off two early goals like a true professional and made the saves when they were needed. And Jamie Benn stepped up to seal the deal. Let's get into the play-by-play. What a crazy start to this game. Chicago started it out with a shot from behind the net by Spencer Machacek that deflected off of Climie's skate and into the net. This was the 3:22 mark. Just a minute later, Climie had his left pad on the puck, but a second effort from Brett Sterling put the puck over the goal line. Texas was down 2-0 just 4:22 into the game. Texas decided that was no good and turned on the offense. Only 33 seconds later, Landon Wilson scored his second of the playoffs on a two on one with Travis Morin, halving the lead. Just twenty second after that, Scott McCulloch knotted it up at 2 on his first of the playoffs. Texas and Chicago had combined for four goals in 113 seconds. The Stars took the first penalty of the game but then Chicago took 3 straight. Usually, that's a good thing, but the Stars surrendered their first shorthanded goal of the playoffs with just under two minutes left in the period. Garrett Stafford walked right into Spencer Machacek on the breakout, and Machacek broke in on Matt Climie alone and beat him clean for a 3-2 lead that they would take to the break. Texas outshot Chicago 20-15 in the period. The game slowed down a bit in the second as both teams settled in. Chicago and Texas each scored one in the period. The Wolves went first with a lethargic play by Texas. Joey Crabb and Tim Stapleton broke in two-on-one against Texas. Forward Francis Wathier didn't get back to support the defense in time, and Stapleton practically walked in on Matt Climie and elevated it over his left pad for the 4-2 lead. The Stars came back on an Aaron Gagnon breakaway opportunity to make it 4-3. The Stars and Chicago only combined for 17 shots in the period, with Texas leading 9-8 and overall 29-23. Texas had twenty minutes to tie it up. And tie it up they would. Colton Sceviour and Jamie Benn broke into the zone with Maxime Fortunus trailing the play. Sceviour dropped a pass to the trailing Fortunus on the left wing side who one-timed it past MacIntyre to tie it at 4. Chicago would not be kept down though and tied it right back up. An unintentional pass from Brett Sterling landed on the stick of Jason Krog, who backhanded it to the net and beat Climie up top. The Stars trailed 5-4 with 10 minutes left in the game. Andrew Hutchinson made sure that it wasn't the final score though. An icing call on the Wolves gave the Stars an offensive zone faceoff with a tired Wolves crew on the sheet. Texas's Travis Morin won the faceoff back to Fortunus who sent it to Andrew Hutchinson. Hutch slapped it home to tie it at 5. The Stars would close out the period with the score the same and go to overtime to decide it all. Warren Peters made sure it went to overtime by preventing a cross ice pass with just a few minutes left. Texas outshot the Wolves in the third 15-4 and 44-27 over the regulation periods. Texas dominated play in the overtime. Continual offensive zone faceoffs wore down the Wolves. Texas outshot the Wolves 9-2 in the overtime period. On the 9th shot of the period for Texas, it was Jamie Benn ending it for the Stars 4:57 into the overtime period. An unassisted effort on the 53rd shot of the night made the Stars the official West Division champion. Texas just took over the game in the third period. In the third period and overtime, Texas outshot the Wolves 24-6. 24-6! That's ridiculous for the Texas Stars. Our first game against Hamilton will be Friday night in Ontario. The Texas Stars and the Chicago Wolves faceoff tonight in a 'one game playoff' to decide who will face Hamilton in the West Conference finals. This game seven is the first in the Texas Stars history. The Chicago Wolves just came off a seven game series against the Milwaukee Admirals, who took them to the brink before falling in #7. The big story here is clearly the injury to Brent Krahn. There is no indication at this point as to the severity or nature of his injury other than it was somehow head related. Many, including Wolves fans, are pointing to a play at the net just before the Stars took their first penalty of the night in the game where Andrew Hutchinson hooked Nathan Oystrick at the net. On the play, some part of Oystrick's body made contact with Krahn's head and forced it into the post. Fans in the offensive zone indicated that Krahn did not seem the same from that point to when he removed himself from the game. No matter what, we know that Krahn will not play in Game 7 tonight. Matt Climie will get his first playoff start of the year, backed up by Richard Bachman. Bachman, who was pulled from a game recently due to injury, backed up Rejean Beauchemin on Saturday in Idaho's win over Stockton. Coach Laxdal indicated he was "day-to-day" with his injury, the nature of which was also unknown to the general public. On the Wolves side, Drew MacIntyre, who had a strong outing in Game 6, may well get the start. Peter Mannino had started all the prior games for the Wolves but got pulled in Game 5 in Texas, which the Stars won 5-3. It remains to be seen if MacIntyre's performance from Sunday is repeatable. He had been less than memorable in all of his previous relief appearances throughout the playoffs. Now though, he stands at #2 in the playoffs with a 1.84 GAA and .914 SV%. Which one is the real Drew MacIntyre? The formula for Texas is simple when you write it down, but hard to execute. First, limit the 'dumb' penalties. With the Chicago PP kicking in at 31.4%, those are not good odds. And for goodness sake, put a man on Anthony Stewart. The forward has 9 goals in the playoffs and 6 power play tallies. But even if the Stars go 100% on the PK, each unnecessary penalty is two unnecessary minutes spent in the Stars defensive zone. This limits shots, which limits goals. The Stars also need Jamie Benn to step up again. His breakout game was Game 5, but he was almost unnoticeable in Game 6. Big time players step up in big time games, so let's see it, Jamie. Finally, the Stars have to make sure that this game doesn't become a track meet. Chicago has a faster pace to their game that will kill the Stars, who have a more defensive and slower paced game. The Texas Stars announced on Monday that goalie Richard Bachman has been recalled from the Idaho Steelheads, Texas’ ECHL affiliate. Bachman was in the ECHL’s National Conference Finals with Idaho, playing in eight Kelly Cup Playoff games. The rookie netminder was 6-2 in the postseason with a 1.43 goals against average, one shutout and a .959 save percentage. Bachman ranked first in postseason in goals against average and second in save percentage. The 22-year old, played in seven regular season games for Texas in 2009-10, going 4-3 with a 2.03 goals against average, one shutout and a .933 save percentage. In 35 regular season appearances with Idaho, Bachman went 22-7-4 with a 2.28 goals against average and a .910 save percentage. He finished first in the ECHL in goals against average, fourth in save percentage, tied for sixth in wins and led the league with four shutouts. Bachman was drafted by the Dallas Stars in the fourth round (#120 overall) of the 2006 NHL Entry Draft. Bachman played the previous two seasons with Colorado College, posting a 39-20-11 record with a 2.24 goals against average and a .922 save percentage. In two NCAA seasons, he posted seven shutouts. The Stars and the Chicago Wolves will play Game 7 of the West Division Finals at Allstate Arena in Rosemont, IL on Tuesday night at 7:00 pm (CDT). The winner of the game will advance to the Western Conference Finals. Texas had a chance to close out the series and become the West Division champion this afternoon in Chicago. It seemed as though the forces conspired against them to make it a seven game series. Questionable officiating, a possible concussion to goaltender Brent Krahn, and an anemic offensive effort put the Stars into their first Game 7 in franchise history. Texas had the early advantage for sure. Noah Welch took a hooking call and Spencer Machacek a cross-checking call early in the game. Texas was unable to capitalize on either power play. Chicago got their first power play at 11:53 of the first period and took full advantage. Who else but Anthony Stewart? A centering pass from Tim Stapleton found Anthony Stewart in the crease and went to the back of the net. With that goal, Chicago is 8/18 in the series on the power play. At that point, Texas was outshooting Chicago 9-4. Just before the 15 minute mark of the first period, Texas had a nightmare moment. On a routine dump-in, Texas goaltender Krahn went to cover up the puck with Spencer Machacek crashing the net. With Krahn already covering the puck, Machacek kept going and hit Krahn. Initially, it seemed as though Machacek had skated over Krahn's glovehand and injured him. However, later it was revealed that Krahn's head slammed into the net on the hit. Initially it was thought that Krahn's head hit the post, but video replays showed this was not the case. He was taken to a local hospital for evaluation and observation. He would not return, and Matt Climie took the net for the Stars. Just after the replacement of Krahn, Texas had one of their best scoring opportunities of the first two periods. It was such a good scoring opportunity that it actually went in the net! Referee David Banfield blew the play dead when he lost sight of the puck. Goaltender Drew MacIntyre did not have a handle on the puck and Jamie Benn poked it home in the crease. Texas celebrated as Banfield wildly flailed his arms to indicate a no-goal. It was clearly a goal though, and Texas was furious. The second period was scoreless for both teams. Texas gave the Wolves six total power plays through two periods. The Stars trailed the Wolves on shots 22-19 at the end of the period. Texas would have to do something they'd never done before: come from behind to win it. The Wolves extended their lead 6 minutes into the third period. Joey Crabb scored on a swatted goal that jumped up over Climie's pad and beat him on the glove side to make it 2-0. Texas tried with the goaltender pulled but could never solve goaltender Drew MacIntyre. Too many penalties led to a lack of opportunities for the Stars. The game was just not one to write home about, I think, for either team. The intensity wasn't as palpable as it had been in prior games, despite all the implications on the line. Texas has to get up for Game 7 and bring the most intense game they've played all year. With Krahn's future in the playoffs now uncertain, Texas may have to bring someone up from the ECHL. Sadly, goaltender Richard Bachman, who backed up Climie several times during the regular season, was injured on Friday night in Idaho's 7-2 loss to Stockton. Idaho's backup, Rejean Beauchemin, is not under contract with the Stars. Who will backup Climie on Tuesday if Krahn is not well enough to play? Chris Whitley from the Allen Americans is a possibility, but I have no clue. The Texas Stars return to where this series began for Game 6 in the series. They return with a 3-2 lead in the series and a chance to knock out the #1 seed Wolves and claim the West Division championship. Texas played the game that they want to play on Friday night and it showed on the scoreboard. There were a lot of shots for the Wolves, but they many of them were low quality shots, the types of shots that are routine for the keeper. Coach Gulutzan was impressed with Krahn's 43 save performance but said, "Brent Krahn's still got some higher level games in his repertoire". Texas will return two players to the ice from suspension in today's game as well. Garrett Stafford, who served a 3 game suspension for elbowing Kevin Doell in the face, and Warren Peters, who served a 1 gamer for boarding Spencer Machacek, will both be back in the lineup. Texas played well without them on Friday, but Krahn made the point, "Just because [Stafford and Peters] are back doesn't mean we can relax". If the Stars can keep the intensity from Game 5 and return those two key players to the ice, they have a great shot of overcoming the home-ice advantage for the Wolves and moving on to the West Conference Finals. Texas is looking to maintain their game plan from the past few games. They played it well on Friday: only giving up one power play goal and scoring one of their own; keeping down the number of quality shots; and getting ahead early and maintaining it. "The hardest thing to do," said Coach Gulutzan after Game 5, "is put a team out [of the playoffs] on [their] home ice." But that's just what the Stars have to do if they are to advance. "A desperate team is a dangerous team," added Krahn. And Chicago is desperate. In case you hadn't been paying attention, until last night the Idaho Steelheads had been tearing up the ECHL playoffs. After a first round bye, the Steelheads crushed the Grizzlies in 4 and had a 2-1 advantage over the Stockton Thunder. The Thunder made the series even at 2 last night with a 7-2 romp over the Steelheads. Richard Bachman was pulled around the midway point of the game after allowing 3 goals on 14 shots. "He's obviously injured, and he won't play (in Game 5)," Head Coach Laxdal told the Idaho Statesman. Now goaltending duties will fall to Rejean Beauchemin as the Steelheads now face a best of three to advance to the next round. Story from the Idaho Statesman. The Stars built an early lead and held on to power past the Chicago Wolves in Game 5 of their best-of-seven series by a score of 5-3. Texas takes a 3-2 lead with the win and has to wrap it up in Rosemont to move on. Texas started out the game just the way they didn't want to, killing a penalty. Trevor Ludwig got his stick up on a Chicago player and Texas went on the PK just 39 seconds into the game. With only 16 seconds left to go in the penalty, Chicago's Anthony Stewart scored his seventh of the playoffs down in the crease. on a pass from the left side. The Stars were in an early hole 1-0. Texas was facing a 6 to 2 shots deficit when Joey Crabb was called for a delay of game penalty. Chicago's Arturs Kulda, owner of the highest regular season plus-minus, put his team down 5-on-3 just 36 seconds later. Texas had a crucial 5-on-3 power play. From practically on the goal line to the right of the net, Jamie Benn snapped a shot high left corner that beat Mannino and tied it at 1. Benn did it again just 3 minutes later. Hanging out in Mannino's crease, he collected a rebound off of Ray Sawada's shot and managed to maneuver around Mannino and roof it for a 2-1 advantage. A questionable tripping call on Aaron Gagnon was evened out when Tim Stapleton took a cross-checking penalty in the offensive zone and set the man power at 4-on-4. Perttu Lindgren tallied his 4th of the playoffs on a deft pass out of the crease to the left wing circle from Dan Jancevski. Texas would end the period with a 3-1 lead and a 14-11 shots on goal lead. Jamie Benn had a say in everyone of the Stars' first period goals and wasn't done yet. Almost 6 minutes into the second period, Jamie Benn did the hard work breaking into the zone and ripped a sick wrister past Mannino glove side high. The goal completed the hat trick for Benn; it was the first home hat trick in Texas Stars history and caps flew down to the ice. The goal also marked the end of Peter Mannino's night, with Drew MacIntyre coming on in relief. Some how Texas did not manage another shot on goal in the period after MacIntyre took over the net. Chicago did though. Anthony Stewart scored his eighth of the year and second of the night just past the halfway point in the period. With three Stars defenders bunched around him, Stewart managed to take the feed from Jason Krog behind the net and convert it into a five-hole even-strength tally. Texas would close the period up 4-2. The shot count was the real story of the period though. Texas only managed 2 shots and scored on one of them. Chicago had 20 shots on goal in the middle frame and also scored once. The shot count through two periods was 31-16. Texas had a scary moment to start the third. Brent Krahn got bowled over by Tim Stapleton and the puck began to dribble into the net. Andrew Hutchinson got in there to start sending it out but the net came off its moorings before the puck crossed the line. No goal. Texas's Krahn continued to be pummeled with shots through the period, but did not yield until the last few minutes. With the score still at 4-2 and Drew MacIntyre on the bench for the extra attacker, Nathan Oystrick bombed one in that came off traffic in front and out to Tim Stapleton. Stapleton spun with it and wired it to the top-right corner of the net, beating Krahn stick side. Texas was only up by one. With the net empty at the end of the net again, the Stars got one more for insurance. Jamie Benn, once again, passed to Aaron Gagnon who netted the empty goal tally. Texas finished the game 5-3. Texas won the game despite giving up the first goal, something that had usually been a bad omen for the team (or any team for that matter). Also, Texas was outshot in the game by a factor of two, 46-23. 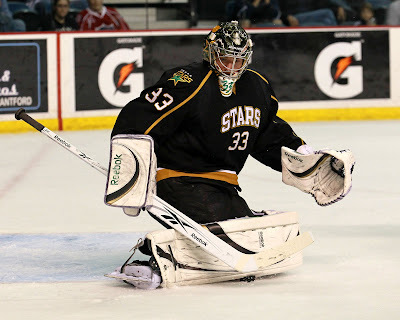 Brent Krahn's 43 saves was playoff record for the Texas Stars. "Shots were 20-something [in each period]," said Krahn after the game, "but a good 60-70% of those were just routine saves and they're just trying to wait for a rebound or bad bounce." Krahn added, "Just because the shots aren't up, doesn't mean we aren't taking it to 'em". The story of the game was clearly Jamie Benn, who stepped up in a big way tonight. After being kept off the scoresheet for three games, his 3 goal, 5 point night was the first home hat-trick and a team record for points in the regular season or playoffs. It was Benn's first professional hat trick. Of Benn, Brent Krahn mused, "90% of the guys would say 'I don't even want to be here, I played in the NHL all season long' and to his credit the guy has character. He's a young guy; he's battled and worked hard." Texas now takes a 3-2 advantage in the series back to Chicago. The Stars have two chances to close it out, Sunday and Tuesday. We'll talk about what the players had to say about that game in Sunday's gameday preview. I did not see Korostin take a single shift. Jamie Benn double shifted with Wathier and Sawada. Sawada assisted on two of Benn's three goals. "We played a little hot tonight," said Coach Gulutzan. "A lot of guys got a lot of ice." "The Texas Stars are battening down the hatches this morning and their practice was closed to the media. I can assure you they meant business with that decree, as Justin and I, who arrived on the team bus, had to identify that we weren’t reporters. "In case there was any doubt about the casual atmosphere of previous morning skates being gone, Wolves staff and players, who typically sit in the stands or line up along the glass to watch some of their opponents’ skate, were also told to leave." Full story is here: No More Mr. Nice Guys. AHL Commissioner David Andrews was in town for Game 3 of the Stars playoff series with Chicago on Tuesday. I managed to snag an interview with him after the game. Tuesday was also the day that Texas announced the completion of the criteria to become a full member in the AHL. Special thanks to Josh Fisher for facilitating the interview. HDH: Can you talk a little bit about the process of getting Texas's franchise and your excitement about the team's permanent status? DA: "Well I am excited in that that limited membership that we granted to the Texas Stars, it was the first time it had ever happened in 74 years of AHL hockey, and there was some element of risk involved in doing that. There were not a lot of franchise for sale and we needed to find one that was saleable and available to come to Texas. We felt a year ago that the likelihood is that we would find one. We didn't have one at the time last May, but we thought that the Iowa franchise probably would be able to be packaged and sold. But as the winter wore on, it became more and more challenging to make that happen and there weren't a lot of other franchises available for sale either. "Looking back, now that we've managed to get it done, we did the right thing. It was important to get the Stars started, get this building going, and establish the AHL here in Cedar Park. Now that the transaction has been approved and will close in the next few days, it really is a great solution. It settles a number of issues that were surrounding the Iowa franchise in Des Moines, and there were some significant issues there. Those are now resolved, the creditors are paid, or will be when this closes. And obviously the Hicks Cedar Park group now have full membership in the league and that whole question of what's happening is no longer a question." HDH: On the future of hockey in Iowa, the Wells Fargo Arena had wanted a hockey tenant. Do you see a future there for the AHL? DA: "Well, I do. I think it's a great building and I think it's a good market. They were making good progress there with the Chops franchise. They just got themselves in a deep hole early on in the beginnings of the franchise that they were unable to climb out of. Clearly, Global Spectrum, who managed the building there, really would like to have an AHL team. The Polk County Commissioners have asked us to work with them to try to acquire one. It's going to be a question of whether at some point one of our teams in another market begins to struggle and is looking for a new home. I think that if that unfolds Des Moines has a great facility and is well-situated geographically for us. It would have to be pretty close to the top of the list of potential new locations for us." HDH: Speaking of new locations, next year Oklahoma City is going to have a franchise and that brings us to 30 teams in the AHL. What's next for the league? DA: "Obviously we're going to Charlotte as well, so Charlotte and Oklahoma City are new markets for us. Getting to 30 has been an objective of ours for some time. This is the first we're going into a season with all 30 of our franchises active and matching up with the 30 NHL teams, which has been a goal of both the NHL's and ours for some time, to be able to have every NHL team with a primary affiliate in our league. "I think [the goal is] simply continued growth. We've had an exceptionally good run in the last two years as a league when you look at the economy of the United States and Canada and how tough it's been. We've been through it really strong. Our attendance has grown; our revenues have grown. We've moved some franchises into new markets, like this one, that have been very successful. So I think it's onward and upward. Right now we're just focused on getting through our playoffs and enjoying the next four to six weeks of hockey because it's a great time of year." HDH: You've been Commissioner for all of the expansions into the Texas market. We now have players started to be drafted out of Texas who may be playing in the NHL someday. Do you attribute the growth of youth hockey to the AHL in Texas? 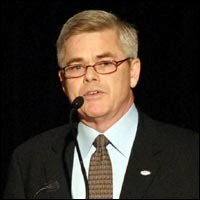 DA: "It may not all be the AHL. There's been some of the lower level leagues in minor pro hockey that flourished years ago in Texas which must have grown the interest in the sport somewhat. The commitment that the San Antonio Spurs (who own the Rampage) have made and the Houston entry ... have made to hockey ... have really driven it as well. I think we'll probably see growth in this market and with Oklahoma City coming in, it's starting to give us a real strong presence in this region and I think OKC is likely to be a very successful franchise in our league. "It can't help but grow the game and I think that's been a big role of our league over the last number of years. It's interesting. Brian Burke was speaking at our All-Star event, and I had never really thought of it and I've been at this a long time, 16 years as President of the league. Brian said at our dinner, 'I know Dave has never thought about it this way but when you think about the growth of the league and expansion of the league in the United States over the last 15-16 years and how that has driven the growth in youth hockey, it's really had an impact on hockey across the US in a lot of markets.' So if that's a spin off effect, it's a really good effect for our league because it's all about growing the game and building more interest in the game." HDH: You mentioned the All-Star game. You've seen the facility here in Cedar Park. What do you think? DA: "Sure, absolutely! I would never say never. I think it's a great facility. I think as the fanbase grows and if the Stars have an interest in hosting, we'd be happy to announce that. It'd be nice to come to a warmer climate at that time of the year! Next year, obviously, we're going into Hershey as this is our 75th anniversary year. All along I've hoped we'd end up in Hershey. I twisted an arm or two, and we're gonna have a great event there next year." Thanks again to David Andrews and Josh Fisher for this interview. The Stars made sure that tonight's game was not like yesterday's and battled back to tie the best-of-seven series at 2. Texas struck first in the game with Travis Morin's first goal of the playoffs. Morin, who had 7 assists so far in the postseason but no goals, found twine on a breakaway homerun pass from Landon Wilson that he shot glove-side high on Mannino. At 6:23 into the first, it was the Stars' first shot of the game. The Wolves would even it up five minutes later on the power play with Aaron Gagnon in the box for slashing. Brett Sterling tipped a Nathan Oystrick shot from the point and beat Krahn. Texas went to the room tied at 1. There was no scoring in the second period, but that doesn't mean there weren't highlights. Warren Peters and Spencer Machacek had been getting into it all game, with most of the hits going toward Machacek from Peters. Warren took it a little far at 7:34 of the second in the Wolves zone and got a boarding major and a game misconduct for his play. Having given up three power play goals the night before, this was a sink-or-swim moment for Texas. "That .. was a little bit of a defining moment in the game," said Coach Gulutzan afterwards. The Stars battled hard and killed off all 5 minutes. "We had struggled with the PK," said Gulutzan, "and I think when you kill a 5 minute penalty off like that I think it gave us some momentum and confidence." Texas managed an 11-5 shot differential in the second period, nearly a complete reversal from the first period's 12-6 advantage for Chicago. Although no goals were scored in the 2nd, the momentum was swinging. Just six minutes into the third, Texas took the advantage again. Again, it was Travis Morin. Greg Rallo bombed a shot from the high slot and Morin collected a rebound off Mannino and beat him stickside on a backhander. Less than three minutes later, Brett Sterling again answered the bell with an odd-man rush that was finished off by his tap into the net behind Krahn. 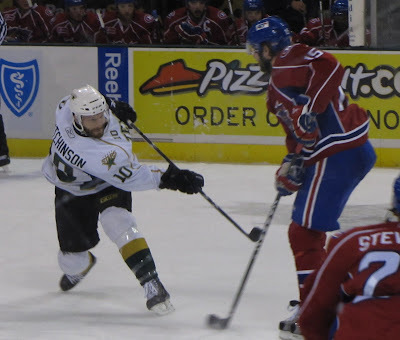 Andrew Hutchinson took a hard fall behind the Chicago net which led to a Texas power play. Noah Welch held him up for an interference call with 8 minutes left in the game. With Dan Jancevski rotated down low and Greg Rallo up at the point, Rallo took a slapper in on net. The initial shot bounced off Mannino and was fed by Wathier to Jancevski, who was in the crease area with an empty net. "If I missed that," Jancevski said, "I'd probably be in trouble." Jancevski didn't fail and put the Stars up 3-2 with 6 minutes to play. The Stars had a few tense moments to end the game as Landon Wilson got his stick high on former Star Ivan Vishnevskiy and went to the box for two. Texas killed it and even got one of their own when Joey Crabb interfered with Maxime Fortunus in the offense zone with just under 3 minutes left. Your final score would be 3-2. Texas did the things they needed to do. They only took 3 penalties in the game, although one of them was the 5 minute boarding major. They minimized shots, only allowing 23 in the game. The Wolves got off 12 shots in the first and then only 11 in the rest of the game. Of Krahn's play, Coach said, "In a seven game series, you don't need great goaltending every night; you need your good goalie to bounce back and that's what he did." Tonight's attendance was 3,017. That number went down a few in the second period though when one fan stuck his hand in the gap in the glass by the Chicago bench and knocked over all of the players' sticks. Then, another fan threw a beer onto the ice just before a faceoff. Both were ejected. All of this transpired after the Stars penalty on Warren Peters. Josh Fisher joined "The Bottom Line" hosts for the "On The Ice" report today. The Google widget is still busted up it appears, so here's the download. It seemed like it was going to be a great night. The Stars opened up the scoring in this one and had yet to lose in the playoffs in games when they scored first. At 2:41 of the first, Perttu Lindgren collected a rebound off Mannino's pads from a Wathier shot and potted his 2nd of the playoffs for the 1-0 lead. Then, 3 minutes later, the Stars were down 5-on-3 due to a Matt Stephenson cross-checking penalty. Nathan Oystrick collected his first of the playoffs on the ensuing advantage. "You can kill the ones where a guy saves a goal or puts someone through the endwall but when you flip two pucks over the glass and take a cross-check," said Coach Gulutzan "those hurt you. I think it took away our energy." Texas struck again to close out the scoring in the period at 11:37. With Riley Holzapfel in the box fro tripping, Aaron Gagnon found twine on a shot that beat Mannino stick-side high against the post. The period ended in a 2-2 tie. Things got out of hand in the 2nd period. Chicago opened the scoring in the period with a Brett Sterling goal at 5:11. Off the faceoff, he patiently waited out Brent Krahn moving across the goal mouth and managed to roof it after Krahn committed low for the 3-2 lead. Texas took 6 minutes worth of penalties in the period, including a double minor to Wathier which overlapped by 12 seconds with Morin's minor. The penalty killers were tired and almost made it through. Nathan Oystrick got his second of the night with 88 seconds left in the period and just over a minute left on Wathier's penalty. Texas was down 4-2 to close the 2nd. They were outshot 13-2 in the second period. The Stars have not managed a comeback win yet in these playoffs. They had also yet to lose on home ice. Something had to give going into the third. Matt Climie came out for the third period to see his first AHL playoff action for the Texas Stars. Krahn had given up 4 goals on 22 shots and Texas needed some momentum going into the 3rd. I don't think it gets any more complicated than that. Chicago tacked on one more 7 minutes in on a breakaway by Spencer Machacek. Andrew Hutchinson defended the pass on the two on one but Machacek didn't need the extra man as he beat Climie clean on the stick-side low. Down 5-2 with 5 minutes left, Texas got something of a breath of life. Perttu Lindgren scored his second of the night and 3rd of the playoffs with a stick-side high snapshot on Mannino. With time winding down, Texas went on the offensive and managed to draw a high-sticking call on hockey relic Chris Chelios. Mathieu Beaudoin pleaded with the refs for a double minor for drawing blood, trying to show the gash he had received in his mouth. Terry Koharski disagreed and only gave 2 minutes. Despite 17 shots in the period, Texas would score no more. The game was over at 5-3. Even the most casual observer of tonight's stat sheet will instantly know what happened in tonight's game. Texas lost the momentum because they took 'dumb' penalties that they didn't need to and then couldn't lock it down on the PK. Texas allowed 3 PP goals on 7 opportunites. It's easy to look back now but if you take those goals away, the game goes in Texas's favor. Texas wants to play 5-on-5 because that's where they excelled tonight. Tomorrow's game is essential. If Texas can't win, then the Wolves can close it out on Friday. Right now though, the series is scored the same as if each team had won their home games. The momentum is certainly different, and we will see if Texas rebounds tomorrow. Coach Gulutzan shuffled the lines in the 2nd half of game two to tonight's lineup and got some good chemistry out of it. He wanted to try it again tonight. Clearly the score was not a product of the lines though, it was the conga line to the sin bin.